Radeon RX 480 graphics card owners can receive a 4-5 percent performance boost with these drivers. AMD has a Valentine's Day gift for singles (or couples) who are planning to spend the day playing For Honor or Sniper Elite 4, both of which came out today. It's a new driver release, Crimson ReLive 17.2.1, that contains performance optimizations and game day launch support for both games. 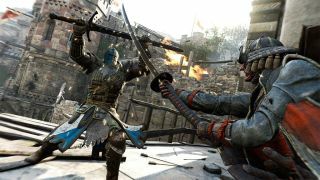 If you own a Radeon RX 480 graphics card, AMD says the new drivers will deliver a performance bump of up to four percent in For Honor, and up to five percent in Sniper Elite 4, compared to the ReLive 17.1.2 drivers. AMD didn't offer up any other examples, though we imagine there's a small increase to be had for most modern graphics cards. On some Radeon GCN products DXVA H.264 encoded video may experience corruption when fast forwarding or seeking through content. AMD FreeSync technology mode may fail to enable itself on some fullscreen applications. AMD Radeon HD 7900 series products may experience shadow corruption when shadows are disabled in Civilization VI. GRID Autosport may experience an application hang when enabling the advanced lighting graphics option. Be sure to check out our review of Sniper Elite 4, which we consider the best Sniper Elite so far. And if you're a For Honor fan, we posted a collection of our favorite moments captured during the beta. As for the latest Crimson ReLive drivers, you can grab those here.